Long reach comfort wipe. Answer to personal hygiene when reaching is difficult. -Ergonomic shape helps those with limited dexterity. Soft flexible head grips toilet paper, tissue or pre-moistened wipes securely. Contains a unique release button for fast sanitary disposal. ESSENTIAL AID. Designed to help people who find it difficult to bend, turn and reach, this toilet aid allows the user to be more self-sufficient in and around their own homes. It empowers individuals to complete the wiping function safely and effectively with dignity. DURABLE CONSTRUCTION. This essential aid is made using a combination of solid plastic and rubber to provide long-term strength and use. In addition to its strength, this cushioned, flexible end is extremely soft against the skin for added comfort. ERGONOMIC DESIGN. This toilet aid features an ergonomic shape to aid those who have a limited range of motion. 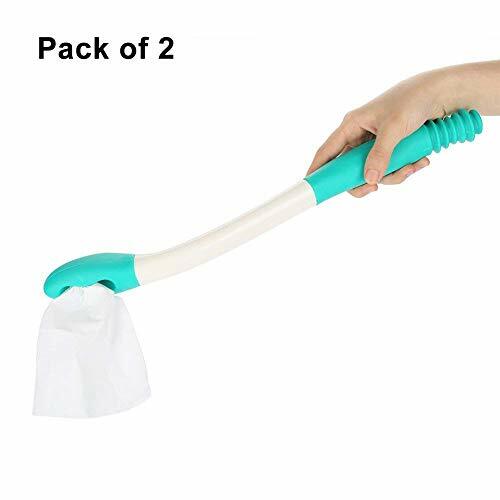 Its ergonomic handle makes it easy to hold and use, while the 14-inch length effectively extends the user's reach when wiping from either the front or back. PROMOTES SELF-SUFFICIENCY. There are a growing number of people who need help wiping due to limited arm and upper body mobility resulting from an accident, surgery, stroke or other debilitating condition. This aid is ideal for anyone who needs assistance, but would rather not require someone's help. EASY TO USE. Insert a few sheets of toilet tissue or a pre-moistened wipe into the soft, flexible head of the toilet aid. This cushioned end grips the paper or wipes securely for wiping convenience. When finished, the tissue can be released by pushing down on the actuator release button on top. Ideal Solution to Personal Hygiene For Those With Limited Mobility. The self wipe toilet aidis a dignified solution for any individual with limited mobility or range of motion who needs assistance when wiping. 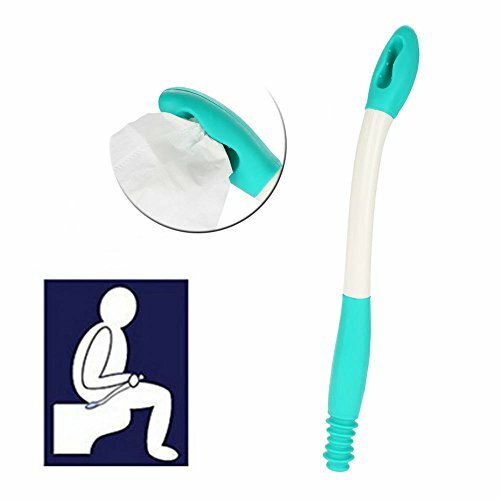 Made of sturdy plastic material for strength with a soft, flexible rubber head for increased comfort, this simple aid extends the reach for users, allowing them to safely and effectively complete the wiping function without assistance to promote self-sufficiency. Simple to use and designed to help you wipe from both the front and back, the self wipe toilet aid is an ideal aid when reaching is a challenge. After use, the user can easily clean with warm, soapy water. Ergonomic Design for Comfort and Ease of Use. Many individuals suffer a limited range of motion in the arms and upper body due to an accident, surgery, stroke or another debilitating condition. Designed to make using the toilet easier and dignified for people who need a little help but don't want to rely on others, the self wipe toilet aid is the perfect answer for people with limited mobility who find it difficult to bend, turn and reach. 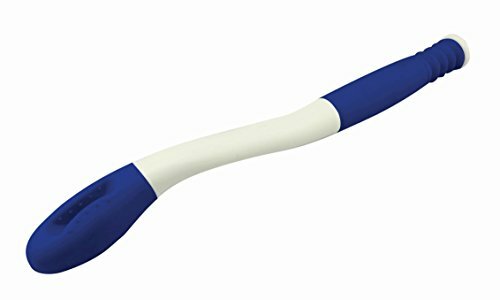 Offering optimal comfort and ease of use, the ergonomic handle fits in any size hand, while the cushioned grip holds either toilet tissue or pre-moistend wipes securely in place for wiping. When through, a unique release button on top allows for fast, sanitary disposal. Buckingham Pocket Easywipe Bottom Wiper with Soft Touch Carry Pouch. Folding Personal Hygiene Aid to Assist with Wiping - Extends Reach for Improved Personal Hygiene. Grips and Releases Toilet Tissue. 1. Select the length of toilet tissue which should be approximately 4 sheets long. 4. Tuck the paper into the recess to hold the toilet tissue in place for cleaning. 5. To release the used paper gently shake the Pocket Easywipe over the toilet pan disposing the tissue into the toilet. The Bottom Wiper has been laboratory tested for strength and durability. It has been tested to destruction and will withstand 100 Newtons of pressure / force (22 LBS/10kgs) before robustness is compromised. The Self-Wipe-Assist is the answer to personal hygiene when reaching is difficult. The ergonomic shape of the Wipe Assist helps those with limited dexterity. Our soft flexible head grips toilet paper, tissue or pre-moistened wipes securely while its ergonomic design reaches were you can't. This ultimate toilet aid contains a unique release button for fast, sanitary disposal. 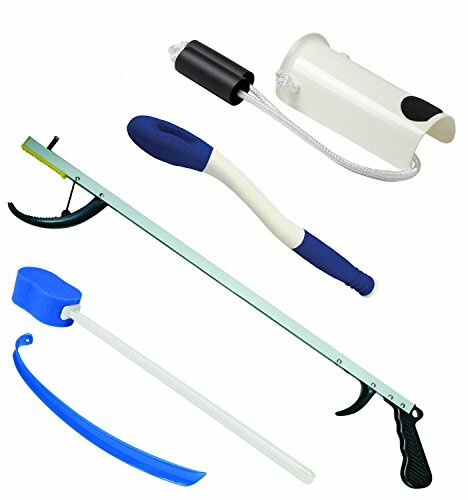 EXTENDABLE & PORTABLE BATHROOM AID - Use the included parts to achieve lengths of 14 or 22 inches. Purchase additional 4 extensions for more options. Includes toilet aid privacy carry bag for discreet travel. Truly a great medical aid for bathroom help. SELF WIPE TOILET AID WITH SUPERIOR GRIP & RELEASE - Minimal strength required to grab & release toilet paper or tissue paper. 3 prongs at the tip are made of soft grippy material to hold items in place easily but realse with the flick of a finger. Release won't get stuck like other products. 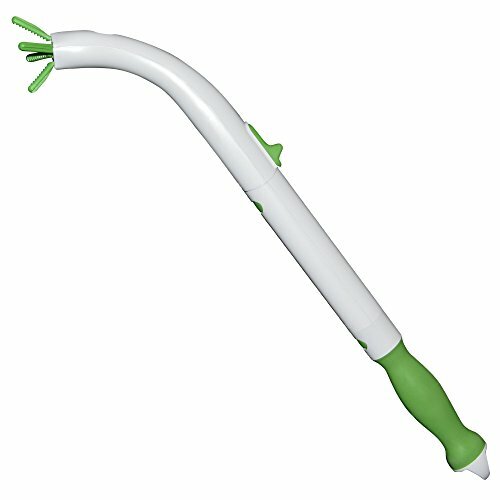 EASY TO HOLD & OPERATE, LONG REACH TOILET PAPER AID - Soft, grippy green rubber handle is easy to hold, but is even easier with adjustable size black band to ensure the Freedomwand never falls. Ideal for individuals & seniors (elderly) with weak grip strength. When you find reaching difficult due to mobility problems, a bad back or even an injured elbow, shoulder, or wrist; personal hygiene after using the toilet can be a new challenge. This may mean that you find it difficult to, or simply can not wipe clean. The Buckingham Easywipe Bottom Wiper gives you a longer reach and is ideal for those who have limited reach or flexibility. Most other toileting aids require that you physically remove the soiled toilet paper compromising your personal hygiene, it overcomes this with a unique and comfortable gripping slot that secures the toilet tissue for a quick and easy wipe. Once you are ready to dispose of the toilet paper the quick release button on the top of the bottom wiper can be pressed to release the used toilet paper without needing to touch it. Since the toilet aid is compact it is a great addition for those needing a solution when leaving home, going on vacation, camping, or traveling without the need to take up extra space. It comes in a carrying case that is convenient and sanitary to store your toilet aid when not in use. LONG REACHING: Flexible head holds toilet tissue paper or pre-moistened wipes. Curved, 15" long design reaches and wipes where you can't. GREAT FOR ON-THE-GO USE: Folds into a small size and comes with a hard plastic designer case that can fit in your car or purse. Maintains your privacy and dignity while traveling, going on vacation, or when out and about. Latex-free. EASY TO USE: Open the toilet aid until secure (holding it the wrong way will cause it to close and fold back up when using). Wrap around toilet paper (at the most 4 times) tucking each end of the toilet paper into the gripper. Press the button at the top of the toilet aid to release the tissue. DESIGNED BY AN OCCUPATIONAL THERAPIST: Wonderful for those with limited mobility or limited reach or dexterity. COMPACT AND LIGHTWEIGHT: Product Dimension when fully extended: 1 L x 1 W x 15 H. Product Dimension when in carrying case: 1.5 L x 3 3/4 W x 8.5 H. Weight: 0.4 Lbs. No Assembly Required. Made in China. Try soft and gentle Cottonelle Gentle Care Toilet Paper. View larger Keep Cottonelle stocked in your home with Amazon Subscribe & Save. View larger Having a conversation about what goes on in the bathroom may seem out of the question, but Cottonelle wants to challenge you to talk about your bum. Speak with friends and family about the Cottonelle Care Routine, combining both our Gentle Care Toilet Paper and moist flushable wipes. Feel cleaner and fresher* when you combine Cottonelle brand s most gentle toilet paper with our flushable cleansing cloths. Give your family the gift of comfort with the Care Routine. Let s Talk About Your Bum You want the best for your bathroom routine. So, why wouldn t you want to compare notes with friends and family? Let s talk bums. Try the routine everyone is buzzing about the Cottonelle Care Routine. By using our Gentle Care Toilet Paper followed by our flushable cleansing cloths, you get our ultimate in gentle and soothing, combined with a fresh feeling that can follow you all day. Once you ve tried the Cottonelle Care Routine, you won t want to keep it to yourself. One Little Switch For A New Feeling Some toilet paper can be harsh. 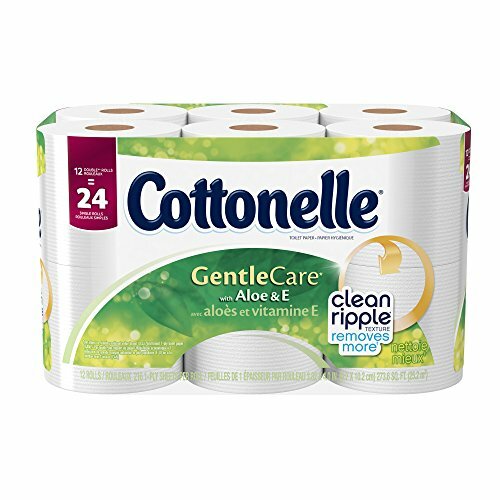 Dermatologically tested Cottonelle Gentle Care is one little switch that can change how you feel, made with aloe and vitamin E. Pamper your family and stock your bathroom with Gentle Care Toilet Paper. Keep Cottonelle In Stock And Save With Amazon Save money while feeling cleaner and fresher with the Cottonelle Care Routine. 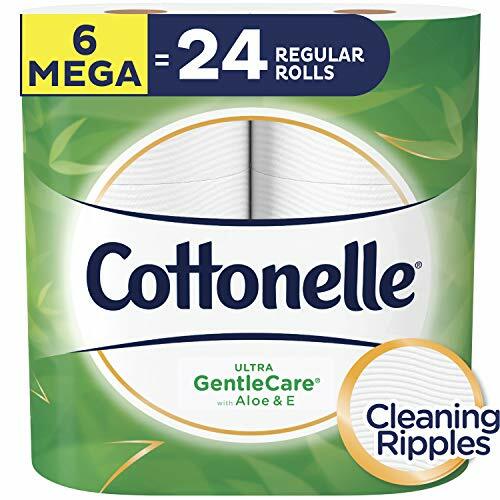 * Save up to 15% on Cottonelle products by using Amazon Subscribe & Save. The program allows you to take advantage of free shipping and routine delivery, so you never run out of Gentle Care Toilet Paper or Cottonelle Flushable Cleansing Cloths. Cottonelle Gentle Care Toilet Paper is safe for sewer and septic systems. Cottonelle Gentle Care bathroom tissue contains Aloe and Vitamin E.
Our bath tissue is dermatologically tested for sensitive skin. Double Rolls fit standard toilet paper holders without the need for any attachments. EXTENDABLE & PORTABLE BATHROOM AID - Total length is 14 inches. 4-inch extensions available for purchase separately to add length. Includes toilet aid privacy carry bag for discreet travel. Truly a great medical aid for bathroom help. SELF WIPE TOILET AID WITH SUPERIOR GRIP & RELEASE - Minimal strength required to grab & release toilet paper or tissue paper. 3 prongs at the tip are made of soft grippy material to hold items in place easily but release with the flick of a finger. Release won't get stuck like other products. 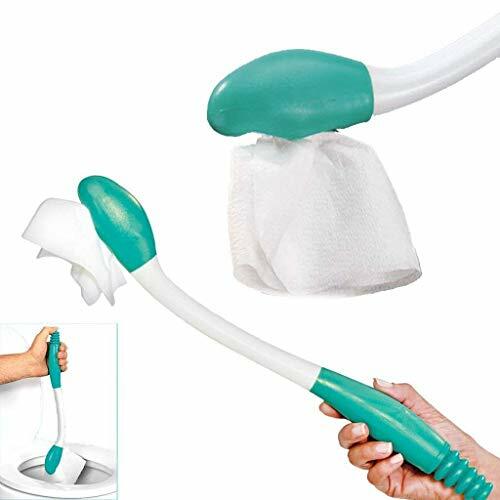 EASY TO HOLD & OPERATE, TOILET PAPER AID FOR SELF-CARE - Soft, grippy green rubber handle is easy to hold. Easy-release button drops tissue paper into toilet easily. Ideal for individuals & seniors (elderly) with weak grip strength. BodyHealt is a premier brand in aids to daily living and homecare devices. BodyHealt products are adaptive living aids that help people cope with their environment. Whether you are a therapist or patient, someone with special needs, or just have a need to make life easier and more accessible, BodyHealt products can help you. This Metal Toilet aid is one of the products that will ease your day to day life, and ensure full comfort and independence. PROMOTES SELF-SUFFICIENCY. There are a growing number of people who need help wiping due to limited arm and upper body mobility resulting from an accident, surgery, stroke or other debilitating condition.This BodyHealt Toilet Aid Features an easy to use design specifically for individuals with, back pain, inability to reach, or limited range of motion. ERGONOMIC DESIGN. 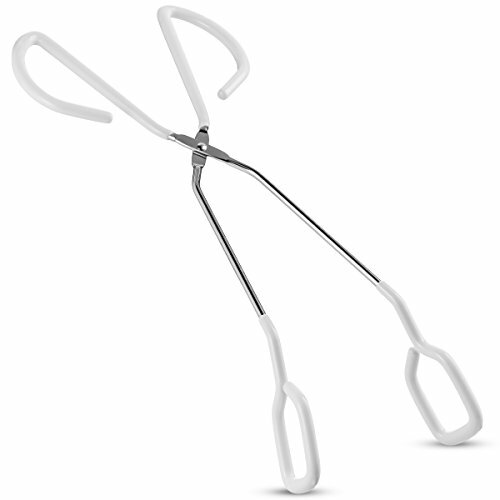 The ergonomic 15 tong design enables single handed wiping. Additionally, the slightly angled ends will ensure more precise use. DURABLE CONSTRUCTION. Your BodyHealt Toilet aid is manufactured with a Stainless Steel quality build with Vinyl Coated handles to ensure utmost durability so you can enjoy its long lasting use. Additionally it's reinforced joints add extra stability to extend the life of the product. DESIGN Designed with a gripping recess to tuck in one end of the toilet paper or wipe, and then wrap the remaining length of toilet paper or wipe around the wand head. APPLICATION Lightweight, designed for individuals with limited range of motion, inability to reach, or back pain preventing movement. HELPFUL BATHROOM AID No need to touch tissue after use; simply push the button and the tissue is released. Simple-to-use and easy-to-clean. HIGH QUALITY Made from high quality plastic, durable and sanitary. With a button at the end, can automatically remove the used tissue. Can replace the wiping function of finger. Suitable for dry or wet tissues. COMFORTABLE Soft and smooth design, comfortable to use. Clean with soapy water; 100% Satisfaction Guarantee. Ergonomic shape helps those with limited dexterity. There is a release button for easy disposal that will amaze you with the perfect angles. Long reach of 15" makes the difference. Sturdy comfortable plastic for easy care with soft ends. Ideal for individuals who are older, large, recovering from surgeries, or suffering from back injuries. Easy to clean. Just simply wash with warm water and dish soap. Easy to use, just wrap toilet paper around the head of the wiper and push a portion into the opening. Wipe, and then press down on the handle to release the paper for sanitary disposal. Designed to aid those whose dexterity is limited, our extended reach wiper features a generous 15" length and an ergonomic grip and shape for bathroom cleanliness. Ideal for individuals who are older, large, recovering from surgeries, or suffering from back injuries. - Perfect for people who have a limited range of motion, as elderly, arthritis, pregnant woman and more. 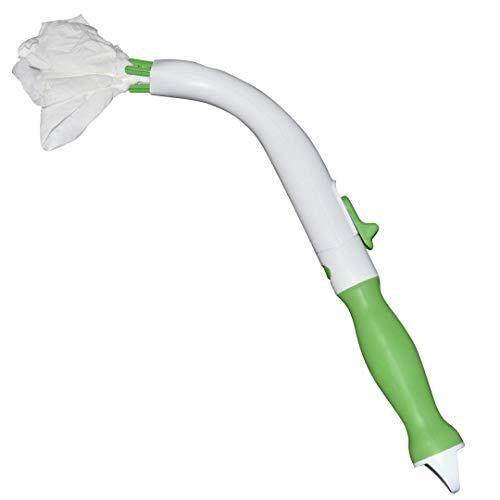 - Helpful tool to complete the wiping function safely and effectively independently. - Long handle and durable ABS construction for use. Perfect for people who have a limited range of motion, as elderly, arthritis, pregnant woman and more. Helpful tool to complete the wiping function safely and effectively independently. Long handle and durable ABS construction for use. Wiper extends your reach an additional 15.25"
Dimensions: 2" x 1.4" x 15.8"
This product is suitable for those with arm or back strength disorder. Can replace the wiping function of finger. Made from high quality plastic, durable and sanitary. Suitable for those with arm or back strength disorder. Soft and smooth flexible head grips toilet paper, tissue or pre-moistened wipes securely, comfortable to use. Long Reach Comfort Wipe, ergonomic shape helps those with limited dexterity. Suitable for dry or wet tissues, can replace the wiping function of finger. Made from high quality plastic, durable and sanitary. With a button at the end, can automatically remove the used tissue. 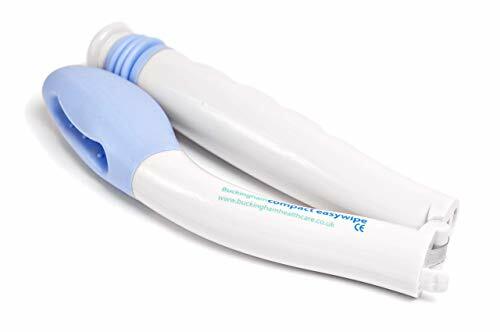 Many people due to limited arm and upper body mobility resulting from an accident, surgery, stroke or other debilitating condition, need help wiping, use this kind of Self-Assist Toilet Medical Aids will not require someone's help. Extends your reach 15.25" for better cleansing. Size: 15.75 x 2 x 1.25. Rehabilitation following hip or knee surgery is an important step in your recovery. self-assist toilet aid and long handle sponge to assist those who have limited mobility. The BodyHealt contains a collection of essential ADL products to assist those who have trouble bending over.